The readiness of state accountancy boards to assist the US Department of Housing and Urban Development in ascertaining that licensees are in good standing with their boards was underscored in a letter sent by NASBA’s leaders to HUD on March 31. 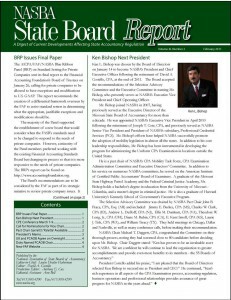 While not disagreeing with HUD that its proposed Independent Public Accountant (IPA) Roster [see sbr 3/08] could contain very helpful information, the letter pointed out that some of that information is already available and stressed the importance of HUD directly contacting the state boards when substandard work is discovered. “Referral of failures of auditors of HUD entities and individuals to Accountancy Boards would result in actions that would not only provide for appropriate enforcement against auditing firms and auditors, but would also result in better protection of the public. Failure on a HUD audit engagement indicates a failure to practice under the state board of accountancy’s rules and regulations, in addition to not meeting HUD’s expectations,” the letter stated. The complete text of NASBA’s response to the proposal can be found onwww.nasba.org in the “news” section. HUD Secretary Alphonso Jackson announced on March 31 that he would be stepping down as of April 18, 2008. He has been under investigation by the Justice Department for alleged cronyism in connection with housing contracts awarded in New Orleans, Philadelphia and the Virgin Islands.